The other day I thought I was just another normal Knitter. You know -- closet full of yarn. A number of airtight plastic tubs full of yarn tucked under the bed and stacked in corners. A handful (okay, King Kong's hand) of harmless-looking tote bags of various sizes tucked discreetly into corners, inside the TV cabinet, in the storage closet, and under the futon. In the car, a couple of projects in case I get stuck waiting somewhere a really, really long time. Socks in my daily tote bag for the same reason. And then there's always a pet cozy on the needles in my desk drawer at work -- just in case I get a lunch break -- and a couple of 5-gallon plastic kitty litter buckets full of small projects at Mom's house. Only two. Honest. Gotta have something to keep my hands busy when I visit. In my sock drawer here at home, you'll find a few random skeins of sock yarn to inspire me. Oh, and two projects in that clever storage ottoman in the living room. I like that ottoman. It is a plain, beige ottoman. It looks like something you just put your feet on. Who would think it has yarn in it? It's like having stealth stash. So I tried to do a little Spring Stash Organizing. I now realize that either I am in a Stephen Spielberg movie, or I have been transported to Area 51, because there are more UFOs flying around this house than I ever thought possible. Two projects, gifts, and so nearly done that they are almost ... and I mean they are THISCLOSE to being ... FOs. 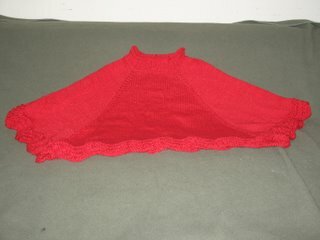 There is also a lace baby blanket, in cotton, needle size US6, for the first-born of our nephew and his wife. However ... praise the ancient gods of Scotland ... this baby-to-be is a Crawford. I can have absolute confidence in the fact that the wee wane will be late. Also, for Crawford reasons, it's being done in a soft, natural, cotton which can be yarked upon by baby, merrily slobbered on by happy dogs, and washed with complete disregard for fiber-mercy of any kind. And all I have to do is block it. Koigu KPPPM merino sweater for me, in yarn from Stitches West 2006. Yum. Koigu lace merino shawl for me, also from Stitches. Saints socks. New Orleans Saints team color socks. Exactly 1.75 New Orleans Saints socks, to be exact. The Saints Socks were to be among Dad's 2005 Xmas gifts, but Dad passed away and then Katrina hit. I have not been able to deal with these socks yet. Inca Alpaca gansey for me in an amazing shade of cat-eye green. Yum again. Needles: US5. Another funfunfun kid's poncho for a dear friends' daughter. Can't show it because it is a surprise. This was also supposed to be for Xmas 2005, but Katrina derailed me. This one is crayon-box stripes in Unger sportweight Utopia done serape-style for an 8-year-old. One skein, assembly and finishing left on that one. This, along with the red poncho shown above, resides in the ottoman in the living room. Shiny, happy, mindless TV knitting. One gauntlet, in my own handspun, on size three needles. Matching hat, half done, in my own bulky handspun, size nine needles. Sweater for Dave, also pre-Katrina, just a casual pullover sweater from washable wool-blend oddballs. Size 7 needles. Newly cast-on sweater for Dave, in luscious, soft, sweet-smelling Forever Random from La Lana Wools, purchased at Stitches West. Dave met Luisa and picked out his own sweater yarn, so this will be a significant sweater. Einstein for Mom, for this Xmas. Four inches of an Einstein, anyway. This is being done in a rosy-tweed bulky yarn, a washable acrylic/wool blend, from Michael's craft store's "Passport" yarns. 1.5 socks in Opal variegated ocean blues and greens, size two needles. One sock cuff in my own handspun from a very nice sheep named Sabrina. Two hats in my handspun, on size 4 and 6 needles. One third of a stole in various glam yarns in shades of blue, green, and purple on size 10 needles. Half a French-style string net shopping bag, in crochet cotton, color natural (also a car project). I have been knitting for 40 years. OK, I admit that Grandma started teaching me when I was in kindergarten. But still and all ... I have been knitting for so long that I don't just have vintage clothes, I have vintage projects, incomplete garments which will become instantly vintage the very moment they are new. Torso (sewn together, even) of tailored jacket, to be part of skirted suit, knitted in perle crochet cotton on size three needles. Vintage: 1989. The problem is not the needle size. I like size three needles. I would much rather knit on needles in the size range of US one through five than any other size. But the whole thing is in heel stitch. In cotton. The resulting fabric has a terrific drape, resembles good corduroy, is lustrous, and weighs about as much as a deisel locomotive. It looks elegant, even. But heel stitch....miles and miles of heel stitch. In cotton. What was I thinking? If I can only get past the sleeves, I know I can summon the will to cast on for the skirt and just go round and round and round and round and round and round until I run out of yarn. But ... heel stitch ....? Round and round and round in heel stitch? In cotton? What was I thinking ... or drinking ... when I had this idea? Was tequila involved in this decision? Kimono sweater of my own design, in Rowan Donegal Brights sportweight wool, also on size 3 needles. Vintage: 1994. Yarn bought on clearance sale in mad, random colors. I was inspired by Kaffe Fasset at the time. Still am. But I am completing the long, skinny strips of this sampler sweater by doing some "challenging" stitch work like Barbara Walker's cable spider. At the geologic speed of completing one strip per year, I should finish it in 2013. Beret in Lang Vera Stretch Wool (navy) on size 6 needles. Of course, this purchase of this yarn was a Magpie Moment, and I bought only one skein. Of course, I ran out of yarn 2/3 of the way through, with a hole the size of a yarmulke needed to complete the top of the beret. Of course, this yarn has been discontinued. What ungodly force made me think that one baseball-sized skein would make a beret? It's soooooooooo soft, I do want to finish it someday. Does anyone happen to have even a golf-ball sized oddball of this stuff laying around in Navy? Any dye lot will do. Otherwise, I am stuck with the choice of either ripping it out, or wearing a hat that resembles a fuzzy, dark - blue tire. Hmmmm .... maybe I should start a cult? And these are just the UFOs I can find. Heel stitch suit. My sympathies! However, I suspect the jacket would look splendid with a pair of jeans...? Hey, hey here! I can understand a "few" other UFO's, but I was WITH you when you started that beautiful green Gainsey at Community Coffee. All this time I've thought of it, completed, safely wating for weather cool enough to wear it. Ok, I understand. It's NEVER going to be cool enough here to wear it! So, you could take a winter vacation to celebrate the year of its completion! You deserve it! VBG! Ok, this is officially the most astounding knitting blog entry I've read today. This month. Actually, maybe ever. I think the part about the 'vintage UFOs' boggles my mind the most. a-mazing. How do you remember what you were doing on one over such a long period of 'inactive' status? BTW, I plugged your shawls/potential book in my journal. Aye. Barbara-Kay, the Green Gaelic Gansey lacks only the union of sleeves with body, and the top part of the chest, and the neck. I am stymied by which method of joining I think would look best, although I will end up going with the traditional, I am sure. However I think I will do a mock turtle for the neck. When it is done I will go from tavern to tavern and stand in the keg cooler if I need to, in order to enjoy it, or wait for January and February, and spend a lot of time outside. I wonder if they would let me hang out in the keg cooler at O'Flaherty's with my Guinness? Susan, I can keep track of where I am because the vintage UFOs have not been entirely abandoned all these years. I do pick them up from time to time, and do a few rows of, say, fine cotton in heel stitch, and then I say, "oh, yeah ... THAT's why this isn't finished." And back in the closet it goes. Lorna, I think the jacket would indeed look splendid with a pair of jeans. It is a modified Chanel style. Tunic length, split sides. It does drape beautifully. It occurs to me, belatedly, that this is the garment I should have taken to jury duty some weeks ago, instead of a Fun New Shawl. Oh wow, I feel SO much better reading your UFO list. And not for noble reasons...simply because it makes me feel "normal" to know someone else out there can carbon-date their projects. Oh my gosh !!! I thought I was reading about me. I was thinking " how on earth did she get in my house". I too have a ton of UFO's I'm trying to finish.